Republican Legislatures Are The ObamaCare Death Panels! Sarah Palin yelled and screamed at the top of her lungs about death panels in ObamaCare. Well, she was right. There are death panels in Obamacare, only it isn’t who she thought it was. The Death Panels are all of the Republican-led Legislatures that refuse to expand medicaid. People are dying. People are sick. People need help. All of that falls on deaf ears. These Republican Death Panels don’t care. They have doomed millions to die. 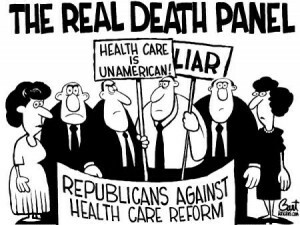 Florida, a state that ranks second in the nation for uninsured, has a major Republican Death Panel. Rick Scott, Will Weatherford, and the rest of the Republicans that refuse to expand medicaid have sentenced people to die. I did a story in March regarding one of those people sentenced to die: Charlene Dill. Read that story here. Rep. Alan Grayson(D) put Charlene’s story into the Congressional Record because he wanted to memorialize what the Florida Death Panel caused. ThinkProgress.org did a story on it here. I memorialized Charlene’s life and death in the Congressional Record, because the Republicans want to pretend that none of this is happening. That Charlene didn’t die as a result of their callous neglect — that no Floridians will die as a result of their willful refusal to expand Medicaid at no cost, But I’m not going to let them forget. I’m not going to let them pretend. This is not a game; this is very real. This is life and death. Rep. Grayson (D) is absolutely correct. For all eternity, it should be shown how the Republican party in Florida sentenced Floridians to die, because of partisan politics. Charlene Dill Campbell will forever be immortalized in the Congressional Record, however the nameless, faceless, countless others who will die because medicaid will not be expanded will not. That doesn’t change the fact, though, that they too, are victims of Republican Death Panels. The state of Florida turned down 51 billion dollars over 10 years. Imagine how many lives that could have saved. Imagine how many jobs that could have created. “The America I know and love is not one in which my parents or my baby with Down Syndrome will have to stand in front of Obama’s ‘death panel’ so his bureaucrats can decide, based on a subjective judgment of their ‘level of productivity in society,’ whether they are worthy of health care. Such a system is downright evil. She was clearly referring to Republican Legislatures, because they are the only ones who have actually done what she described. The Death Panels and bureaucrats don’t belong to President Obama, though. They belong to the Party of No. More stories like Charlene’s will surface. More people will suffer. More people will die. The sad part is that a majority of Floridians want medicaid expansion. Read about that here. Voters need to really express themselves in this election.